A European species, sporadically escaped to fields and disturbed forests. First collected in 1994 in Chippewa Co. by G. E. Waldron. This species has very broad leaves, well-developed ones typically obovate and abruptly acuminate at the apex and strongly asymmetrical at the base, with the longer side even sometimes overlapping the petiole. Samaras are very large and completely glabrous. 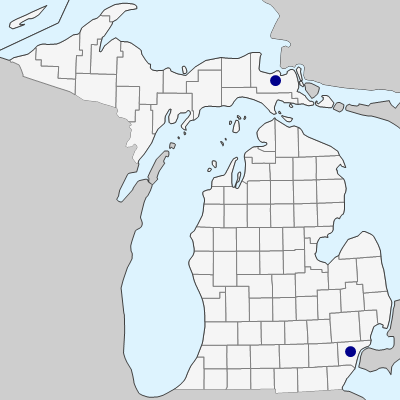 Our few Michigan specimens, however, lack fruits and thus some uncertainty about identification exists. MICHIGAN FLORA ONLINE. A. A. Reznicek, E. G. Voss, & B. S. Walters. February 2011. University of Michigan. Web. April 21, 2019. https://michiganflora.net/species.aspx?id=2749.